Reid Williams is a senior designer and engineer at IDEO Futures, where he works at the intersection of technology, design, and new venture creation. Alongside Joe Gerber, he is kicking off the Bits + Blocks Lab, a pop-up blockchain startup creation lab hosted at the Harvard Innovation Lab. This post, which examines how the technology behind bitcoin could make supply chains much more transparent, is part of the Humans + Bits + Blocks series. 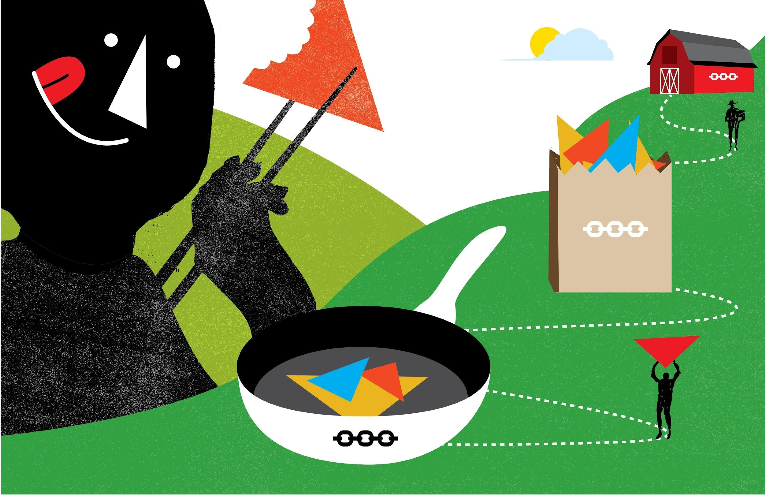 Whether we buy a taco or an iPhone, we’re at the receiving end of a supply chain that often stretches around the globe. Usually we don’t think much about it, and this is a good thing. But sometimes it’s important to know more. Taking a bite out of a taco involves a certain amount of trust: trust that the kitchen that made the taco is sanitary, that the ingredients that went into it are fresh, and that the taco tastes good. This trust is critical, but there’s so much more we could know. We could create entirely new relationships with the stuff we buy, namely where it came from and how it arrived in our hands. Blockchains offer a way to introduce transparency into supply chains and to create entirely new opportunities for participation. As a shared, secure record of exchange, blockchains can track what went into a product and who handled it along the way, breaking supply chain data out of silos, and revealing the provenance of a product to everyone involved from originator to end user. Is this shirt manufactured with child labor? Which of my friends owns the same shirt? Are there any hazardous materials in this couch? What other pieces of furniture are typically bought with it? Is this really the car that Steve McQueen drove in Bullitt? Who else has owned it? Is this bottle of olive oil just olive oil? Where can my sister on the other side of the country buy it? Inspired by the bitcoin blockchain, Skuchain, and smart contract platforms, let’s see how these technologies might change one particular supply chain: the everyday experience of buying, cooking, and serving dinner to friends. It’s Saturday morning and you’re at your favorite bakery, Tantric Flour & Co for a pastry and coffee. A strawberry tart catches your eye and your order one along with a coffee. The tart is amazing, and the strawberries, though baked into the tart, are some of the best you’ve ever tasted. You’re curious about where they came from and pull out your phone to find out more. 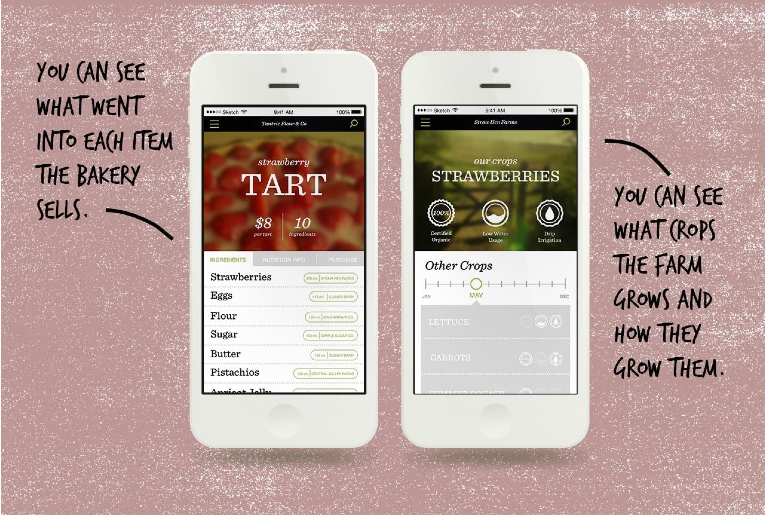 The bakery purchases and manages its ingredients inventory using a system that you can use too on your phone. You see all the ingredients that went into the tart and where they originated. The strawberries came from a small farm about 200 miles away called Straw Hen Farms. Straw Hen records and shares many of the details of how it operates. This lets the farm share good practices with other farms and easily get certifications. You see that Straw Hen grows strawberries in a field that uses drip irrigation and is certified organic and low water use. You can also see what else they’re growing right now: lettuce, carrots, summer squash, and kale. From dinner at a restaurant to a bag of potato chips, every ingredient has a history. Blockchains provide a shared and secured record, letting users see where ingredients come from and how they were produced while letting producers see where their ingredients and how they’re incorporated into finished food products. While drinking your coffee, you follow a link to Straw Hen’s blog and read that they sell directly to individuals and that you can buy their strawberries. 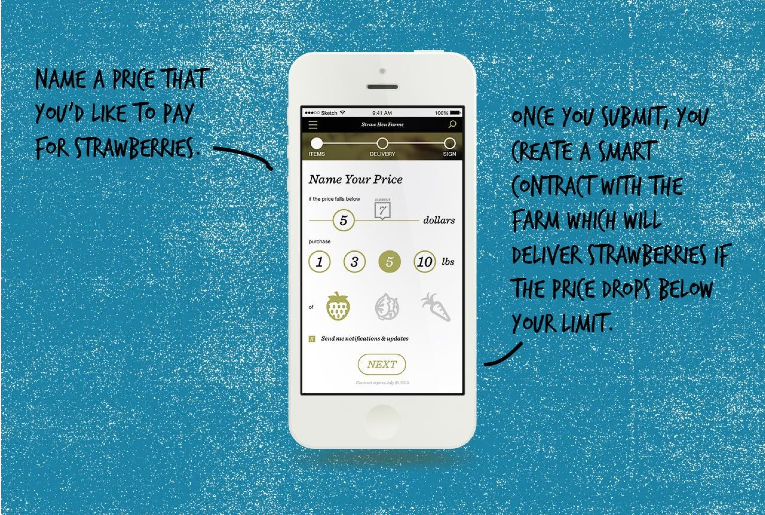 You’re an avid preserve maker and so you buy a smart contract, committing to buying 5 pounds of strawberries if the price goes below $5 a pound. Since the contract is binding and automatically executed, the farm can use it to forecast their revenue for the season. A few weeks pass, and you get a push notification on your phone. Straw Hen is having a bumper crop of strawberries, and your contract has been executed. You have the option to pick them up in the next week at a few nearby farmer’s markets. You see that your neighborhood farmer’s market in Glen Park isn’t on the list (bummer). If you can get enough orders to be picked up there, the farm will set up a booth. You post a link on Facebook to your friends. Saturday rolls around and it’s time for you to pick up your strawberries at the Glen Park market. Your Facebook post kinda went viral and enough people committed to orders that Straw Hen set up a booth this weekend. Excitedly, you head to their stall to pick up your strawberries. Smart contracts built on blockchains create new options for buying goods that include naming your own price or automatic recurring orders. As you wander the stalls, you see one of your favorite fish vendors, Fork & Fish, selling Black Cod. You recall the first time you bought from this stall. It was strange buying fresh fish from an outdoor market but the fishmonger explained how it works. 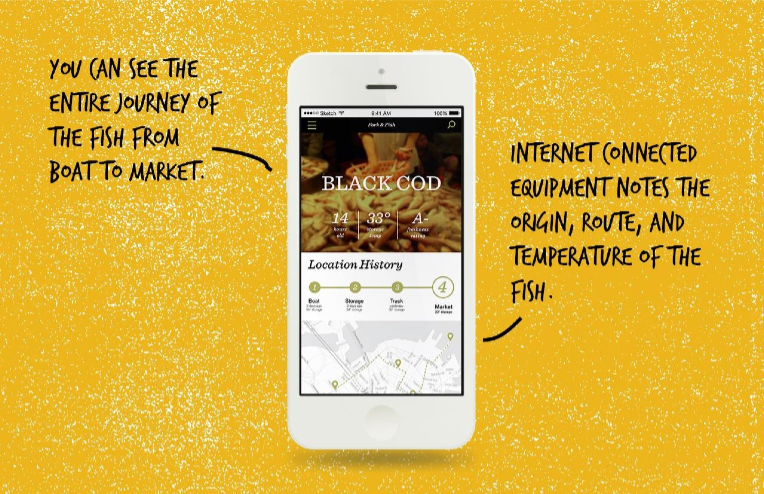 From boat, to storage, to truck, to cooler at the market, the Fork & Fish tracks inventory and uses equipment that monitors and records the storage temperature. Both you and the vendor can see when and where the fish was caught and how it got from the boat to the market. Inspired by the freshness of the Black Cod, you buy some and start planning a dinner party Sunday night. Blockchains can create a formal registry to identify individual goods, and track possession of a good through different points in a supply chain. Internet connected equipment such as fishing boats, shipping trucks, and storage coolers can monitor which objects they’re housing and tag those objects with relevant environmental conditions like temperature or location, providing assurance that a product was safely handled through the entirety of its journey. You swing by a wine shop and see that they’ve got a few bottles of red from your favorite winery, Chalk Brain Vineyards. You have a subscription to the winery which means you prepay for a case of their wine (at a discounted price) and can pick it up at any retail location. You pay full price at the checkout but after scanning the wine bottle with your phone, the winery reimburses what you just paid. You first heard about Chalk Brain through a recommendation from your phone. 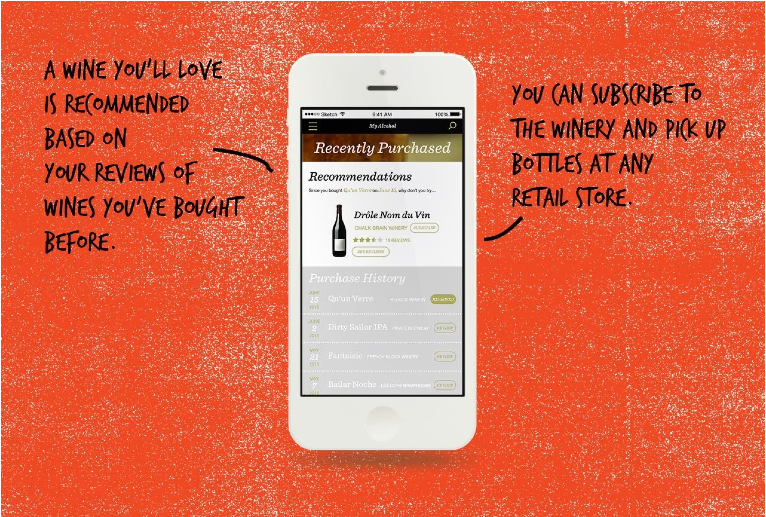 You keep track of all the beer and wine you buy and get suggestions and discounts on new wines to try. It’s anonymous if you want it to be, but you choose to submit tasting notes using your name. Blockchains establish a shared place to track the purchase of goods from the manufacturer, through the point of sale, to the end user, creating a way to track purchasing habits that’s independent of any one retailer or manufacturer. Since identity on a blockchain can be anonymous, users can receive promotions or discounts sent to a bitcoin address without revealing unnecessary personal information. Fish, check. Wine, check. You still want some beer and a dessert. You head to a new place in your neighborhood called Locavore. Locavore is a small market that sells craft foods like honey, jam, beer, and hummus created by people from around the region. You drop off two flats of some lemon marmalade that you made recently, scan them into Locavore’s inventory, and pick up a few bottles of beer made by one of your neighbors. When your marmalade sells, you and Locavore share the revenue, which automatically goes into an account you have. As an inexpensive and open payment system, bitcoin enables new kinds of trading and markets where makers can sell products they make part time. Beyond payments, blockchains create a way to register and sell goods in a more distributed way, as well as to track the identity and reputation of sellers, thus creating new kinds of sharing economies with open participation. Last stop, dessert. You head over to a supermarket you like that has good desserts. As you walk in you see some brownies that look good. You have to be careful though. One of your friends coming tomorrow night has a serious peanut allergy and you can’t serve anything that has come into contact with peanuts during processing. 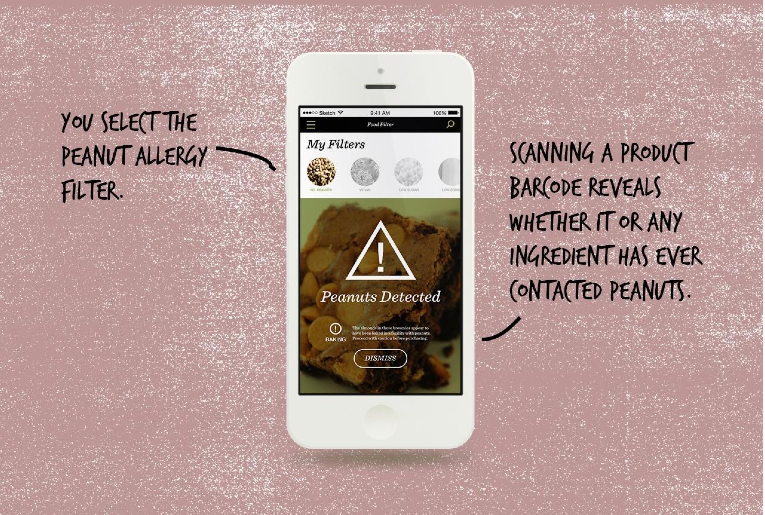 You already have an app on your phone that lets you find products with or without certain ingredients and you have a saved filter for peanuts that you’ve used before. 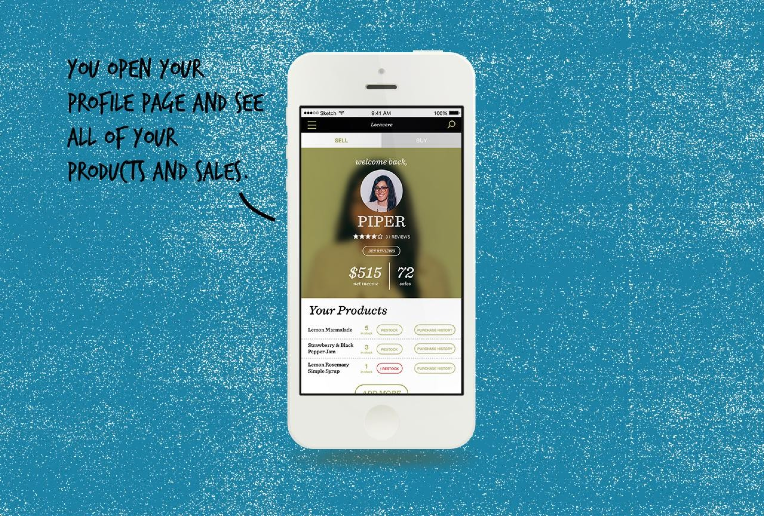 The app checks not just the ingredients of the product, but the entire supply chain of ingredients. You pick out some brownies made in house by the supermarket, but see that the almonds they used were processed by equipment that also processes peanuts. You grab a different kind, brownies made with macadamia nuts and see that they’ll be fine for your friend. The next day as your friends marvel at the amazing dinner, you tell them how you made it, and you digitally share your recipe too: not just what went into it, but exactly which markets and stalls where you bought each ingredient. When blockchains track the movement of objects through the supply chain they can also note how individual ingredients combine to form a newly manufactured item. This ‘provenance tree’ allows an end user to know exactly what went into the product even if it has been through multiple manufacturing steps at different companies. These moments show how in a future with blockchains, our experience producing and consuming food could be quite different than it is today. At the core of this is the ability to assign identity to people, to organizations, and to goods, to track in a transparent way the provenance of goods as they pass from one organization to the next, and lastly, as goods change hands, to exchange payment between the two organizations. 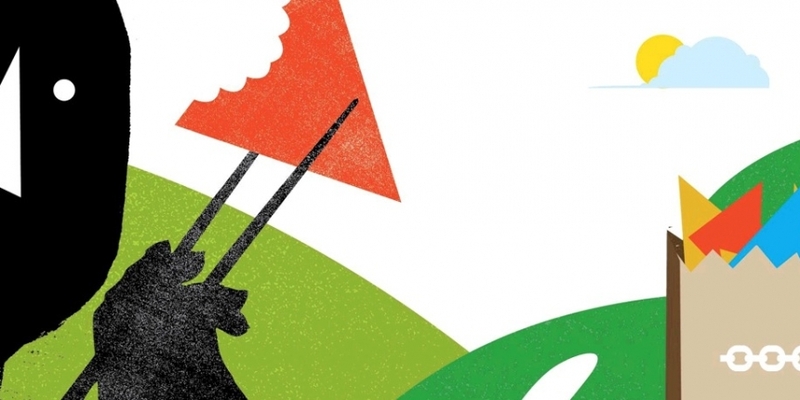 Food is a compelling supply chain because we’re deeply sensitive to where our meals come from, and how they arrived at our plate, but importantly the human-scale impact of blockchains will be felt throughout the world’s supply chains. Written by Reid Williams and Joe Gerber. Visual designs by Nicholas Kluskowski & Nick Dupey.